Only earlier this morning, this correspondent was bemoaning the fact that Facebook, where President Barack Obama is appearing today at a town hall meeting, had yet to move its headquarters to Menlo Park. But optimism grew for a Presidential “spotted” when we saw the barricades go up along Sand Hill Road and, then shortly after 1:00 pm, heard the thunderous sounds of big helicopters overhead, headed from what we could tell, to the playing fields just south of Sand Hill on the Stanford campus. By the time we’d gotten to the corner of Oak and Sand Hill, a small group of neighbors had gathered along the motorcade route. Officer Elizabeth Fambrini of the Menlo Park Police Department was manning the barricades, politely but firmly directing the friendly crowd to where they could stand and watch. “Get your cameras ready!” she warned just moments between the first flashing lights appeared. Then in a flash, the motorcade was gone! 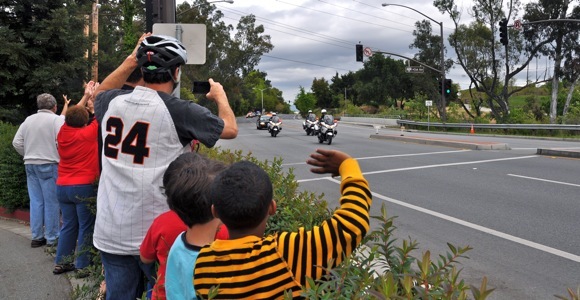 A fun moment for everyone who had stopped whatever they were doing in the middle of a cool spring day to see President Obama in Menlo Park.